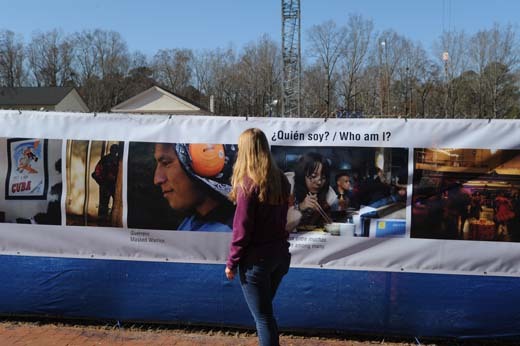 Oxford College students taking intermediate Spanish took photos to document immigrant experiences. 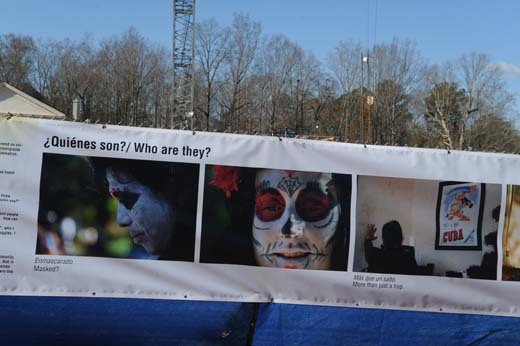 Their images were used to create a banner now hanging on construction fencing around Oxford College's new science building. Photo by Myra Frady. 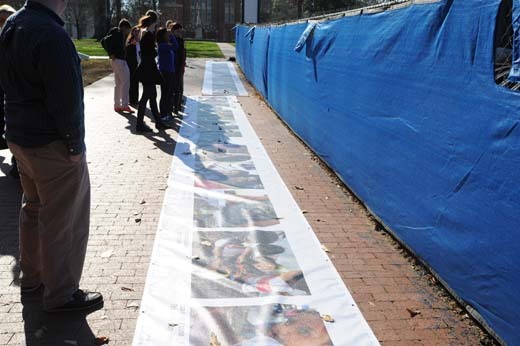 The 80-foot banner was inspired by a similar photo display on the Atlanta Beltline. 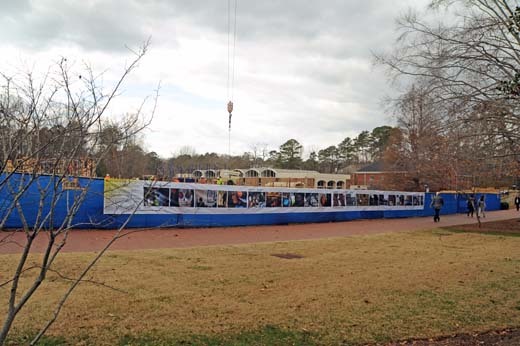 Students from the class joined together to hang the banner on Dec. 9. 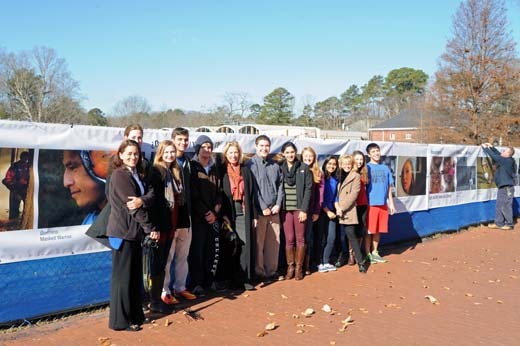 The mural is the capstone project for the inquiry-guided learning course led by Bridgette Gunnels, lecturer in Spanish. Photo by Myra Frady. Three questions guided class discussions and the photos: Who am I? Who are they? Who are we together? Talking with immigrants, students found stories of tragedy, barriers and discrimination. But they also found something familiar: hopes, dreams and a surprising sense of self-recognition. Students photographed school children, campus workers, and the cultural melting pot of Oxford students at Lil's Dining Hall, among other subjects. Of the students enrolled in the class, six are immigrants to the U.S. or children of first-generation immigrants. The completed banner will be on display for about a month. This semester, Bridgette Gunnels challenged her Oxford College intermediate Spanish students to reach beyond conjugating verbs and memorizing vocabulary words, using their language studies to also explore probing questions around identity and immigration. Speaking in Spanish, students discussed U.S. immigration policies and reform movements; transculturalization and Spanish identity questions throughout history, from Columbus' landing in the Caribbean to the Chicano movement; and current topics, such as children on the border. Outside class, they volunteered at an after-school program for the children of Hispanic immigrants and an elementary school with a large percentage of children whose families had immigrated to the U.S.
Then they picked up cameras, documenting images that captured some essence of those immigrant experiences, including a few of their own. The result? 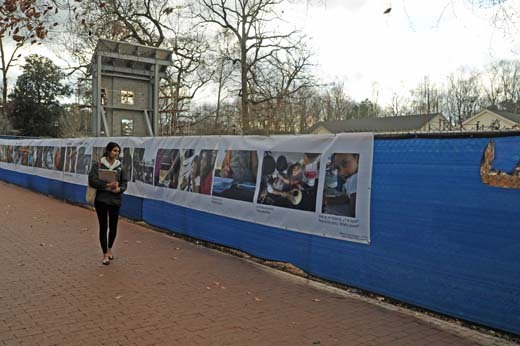 A powerful collection of photographs that has been crafted into an 80-foot mural displayed on construction fencing around Oxford College's new science building, now taking shape on the college quad. 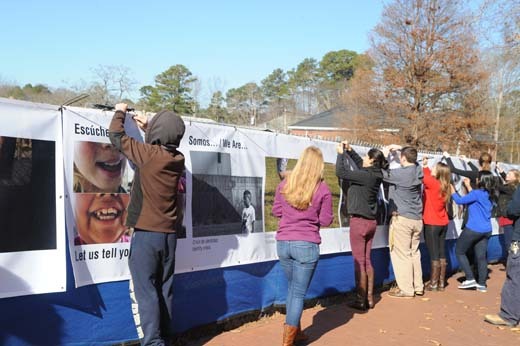 Last week, Gunnels, a lecturer in Spanish, and her students debuted the completed mural as a public art installation, a capstone project for her inquiry-guided learning course, among a series of Theory Practice/Service Learning (TPSL) courses offered at Oxford as a way of integrating classroom theory with community experiences. "The reason this class is so powerful and engaging is because these two high impact practices (inquiry-guided learning and TPSL courses) are merged together," Gunnels says. "It's like a living laboratory — the content informs the service and vice versa." Answers are revealed in images bold and intimate, pensive and joyful — the happy grins of schoolchildren; the soft glow of a traditional Indian Garba (dance); painted faces from a Dia de Los Muertos celebration; and the cultural melting pot of Oxford students at Lil's Dining Hall, among many others. "Photography is a powerful way to capture the human side of things present in our lives every day," says Gunnels, who notes that this is the first time she has attempted a project quite like it. "And the students responded to it," she adds. "Even those who wouldn't necessarily classify themselves as 'creative' really got into it this assignment." Talking and listening to immigrants helped put a very human face on the topic, Gunnels explains. 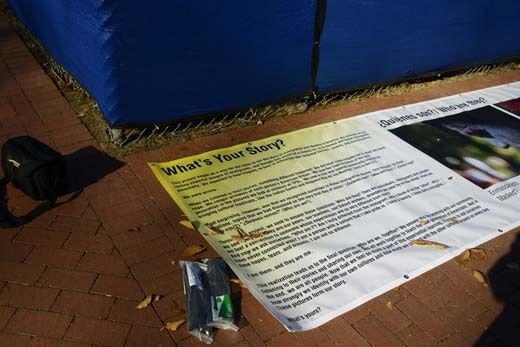 In those conversations, students found stories of tragedy, barriers and discrimination. But they also found something familiar: hopes, dreams and a surprising sense of self-recognition. For Gunnels, inspiration for the project came from Art on the Atlanta BeltLine, which earlier this year hosted a similar site-specific outdoor photography exhibit along the Eastside Trail of the BeltLine in cooperation with Atlanta Celebrates Photography. "It was basically an exercise in storytelling — a huge grouping of photographs that were beautiful in the way they worked together," says Gunnels, who jokes that the exhibit "totally thwarted my run every day" along the BeltLine trail. "That's what I love about public art," she says. "It makes us stop." 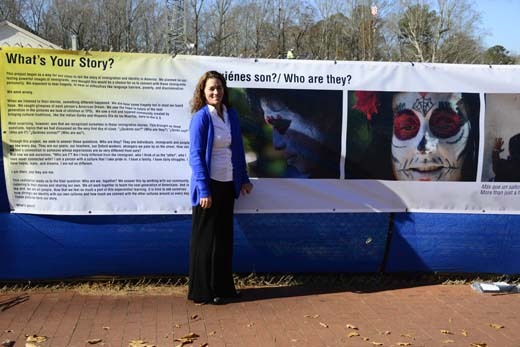 For her Spanish 201Q course, Gunnels was already using images meant to provoke dialogue — photographs to inspire free writing, images that reinforced stereotypes about immigration and identity, and those that "completely break them down." Not only was it a good assessment of Spanish grammar and writing skills, but the exercise "helped gauge where (student) heads were on the topic," she recalls. Asking students to contribute their own photographs seemed a natural next step. First, Gunnels had to find 10 good digital single-lens reflex cameras to borrow that could produce high-resolution enlargements; the final mural displays photos in a 36-inch by 48-inch format. Campus colleagues came through with the technology, and Myra Frady, Oxford's dean for resource planning and chief financial officer — herself an award-winning photographer — even stopped by class to offer photography tips. "We then curated and organized the photos in a way we felt illustrated everything we had talked about and learned," Gunnels says. "The students wrote an introductory panel that tells the story, and I tried to not get in their way." "Once it was rolling," she adds, "I could tell it was affecting people." As a freshman new to the Oxford College campus this semester, Tanushree Khanna thought that she knew something about the "immigrant experience." Her hometown is Punjab, India; part of adjusting to college involved a cultural adjustment to America, too. Surprisingly, the community engagement component of volunteering with Hispanic children would help. "I found that I really connected to the topic," Khanna explains. "Being so far from home, I think I needed to understand my identity. And seeing other immigrants handle these duel parts of their identities made me think, 'If they can do it, why can't I?' Just embrace your culture and be proud of it." Of the 20 students enrolled in the class, six are immigrants to the U.S. or children of first-generation immigrants, including students from Pakistan, India and Nigeria — "definitely the foundation to have a great dialogue," Gunnels says. Oxford freshman Alexa Gunsolley was drawn to the class through an interest in pursuing global health and medicine. "Hispanic immigrants are a growing demographic in the U.S.," she says. "This (class) helped me learn so much about the experiences of immigrants, which are often the same, no matter where they go." For the assignment, Gunsolley photographed a fellow Oxford classmate whom she discovered had grown up in a community near her own hometown of Trumbull, Connecticut. With her pale skin and bright red hair, her classmate "often felt as if she had to play the role of a Latina," even though she is Hispanic, says Gunsolley, whose photograph depicted the young woman carefully studying herself in a mirror. "It's as if she's asking, 'What is reflecting off of me? Do you see what I see?'" In the end, both students were proud of the class effort and the conversations that it may start. "We were asked to take images that really called out to us," Khanna says. "I think it was important for us to put them in an order to show how our understanding developed over this course so that others could see it as a journey into the semester as they walk past." "And now we ask ourselves, 'Who am I?' Am I truly different from the immigrant, who I think of as the 'other,' who I have never connected with? I am a person with a culture that I take pride in. I have a family. I have daily struggles. I have hopes, fears and dreams. I am not so different. I am them, and they are me…"